Are others folks trying this in Florida? If so, where and how is it going? just had a sick session on monday. I paddled out to an island that i go to with a right that wraps, mostly waist and chest high sets...real nice....for the keys it unreal. I could see further on the outside there was maybe a sand bar, with huge waves breaking. Was a bit far, but then i thought this is why i have the paddle and bought this board.....needless to say i paddled out another 3/4 mile to the next sections, and it was over head and just bombing, i got some epic rides and huge drops on a 12 ft board. I hope to get some photos from a couple of guys that went by to go fishing that were freaking out that i was out there. Another epic sesion with more to come, this really makes surf possible for me, love it. Great story, thanks for passing it along! That is something I've always enjoyed, riding point to point over distances be it by windsurfing way back, kites today and perhaps even standup sometime soon. This was around Sand Key? How is your board handling with approaching waves coming and kick turns? I guess you do these sessions with zip adverse wind, correct? If too much wind blows up out of the wrong direction, worse case you lie on the board and paddle and paddle in the old fashioned way? Smart to carry the signaling aid, keeps it out of the way in the paddle. I would probably stash mine in the waist pouch I have used for some of the other distance kiting events. Buffalo Big Board Classic 2007 IMPROVED! I got a nice two piece carbon paddle and have been looking for a board big enough. I have an old Mistral Superlight hanging from my deck in perfect condition....daggerboard and all. Do you think this board might work? Congrats on the speed thing....after watching you on the flats I know how dangerous it can be going that fast.....the water turns to concrete after 50? I have no doubt you won't quit until you are the fastest on the water. 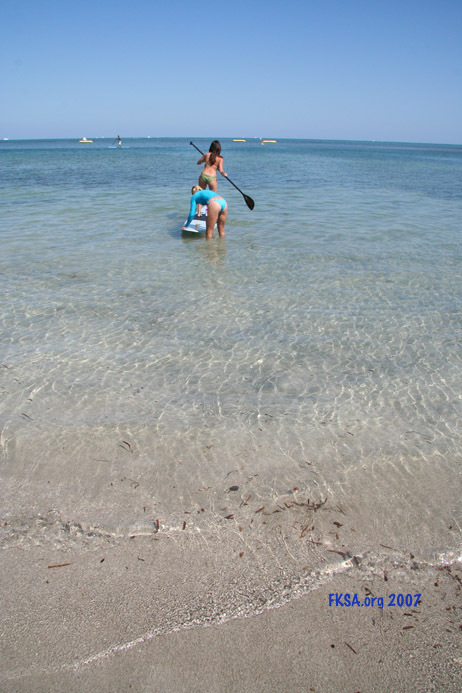 There were some who were paddling out in Crandon Beach today at the KITE 4 GIRLS competition. I think thats the best thing besides kitesurfing. Does anybody know where to try this out or rent equipment? look for a surfboard and strong paddle combination. The Kitehouse in Key West has them, I am not sure if their Miami operation has standup paddle surf gear available or not. In time, I suspect more outfits will have them for rent. Size of the board is critical. I tried out one at K4G's. It was 12' x 4.5" but only 24 "wide. You could see the difference it made vs. body weight (190 lbs. in my case). At one point there were three pre-teen kids just paddling along, stable and gliding well. Lighter guys and women did well too. Heavier guys had less glide per stoke and had to focus more on balance. So for calm water cruising, heavier guys will want a larger standup board for improved glide and balance (say approaching 29 inches in width). In waves, you might want something a bit smaller like was in use at Crandon though. Glide may become less important when surfing waves than manuverability. Lots of photos to come soon. Juan and Morgan from The Kiteshop located on Key Biscayne had a booth at Kite4Girls '07 AND brought along some nifty standup surfboards and paddles for folks to demo. Juan and Morgan are shown moving back to shore above. There were 12' x 4.5" x 26" Mickey Munoz standup surfboards with Pohaku carbon fiber paddles. If you don't weigh all that much and are looking to cruise in the flat water, they work out well. 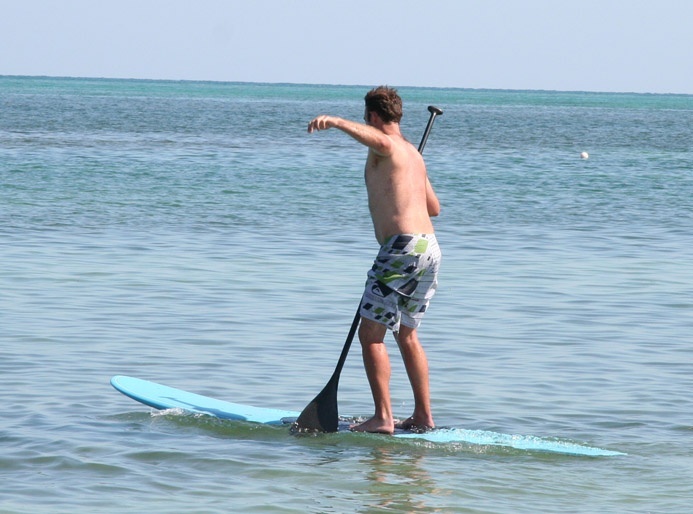 Even if you weight a bit, the smaller boards will give you a workout which is why lots of folks like standup. TWO kids and the board is still riding high and is quite stable. I saw them try to stack up four on this board. If you weigh a bit more, note the submerged tail, you might want something with a bit more displacement (larger). The guy could stand more forward to bring the tail up a bit however. The stability and glide of the board are also reduced. 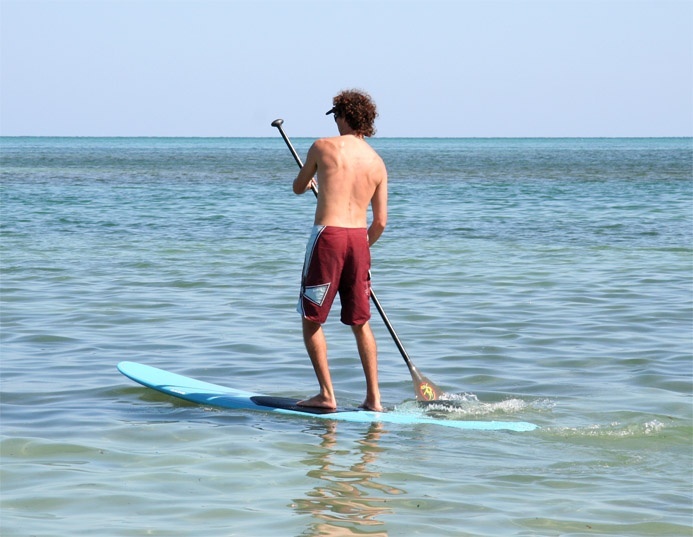 Of course if you are paddling into waves to surf, the importance of weight vs. board size diminishes somewhat. Andrea rides for Viking Surfboards. She hopes that the folks at Viking will whip up a nice standup board for her to promote. Sounds like a good idea to me. Stand straighter Andrea, stooping like that may do a number on your back. Another light fellow, look how high the board is riding. Also note his foot stance, heavier guys would either have to have well developed balance or have their feet parallel at about should width apart for stability. Todd with Adventure Sports has a go. Note how far down the tail of the board is however Todd is back a ways. Todd brings a lot of board skill to the water and copes well despite the lower displacement. 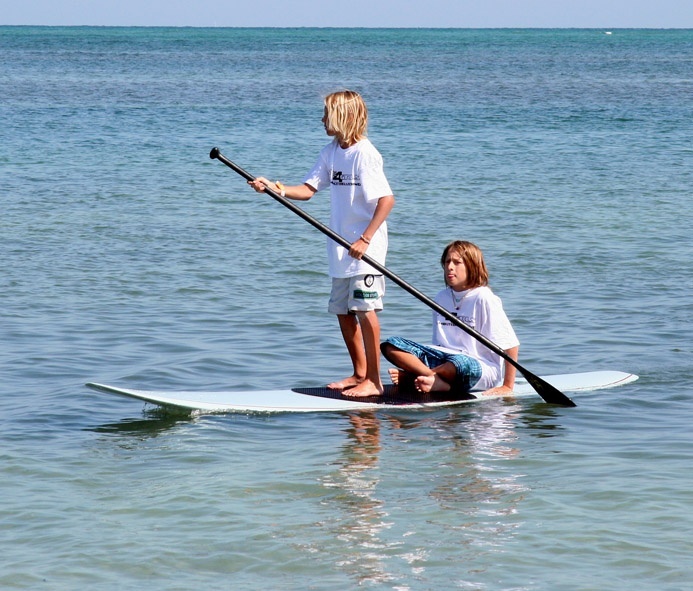 As a rule for calm water cruising larger boards that can build momentum and glide are desirable. For actual surfing something a bit smaller and maneuverable is more the ticket. Morgan and Juan were telling me that they do some nice standup trips around Key Biscayne up to Miami Beach, around the island up to Virginia Key, all over. They mentioned it would be good to add a bump pad near the back of the board to assist in kick turns particularly while wave riding. 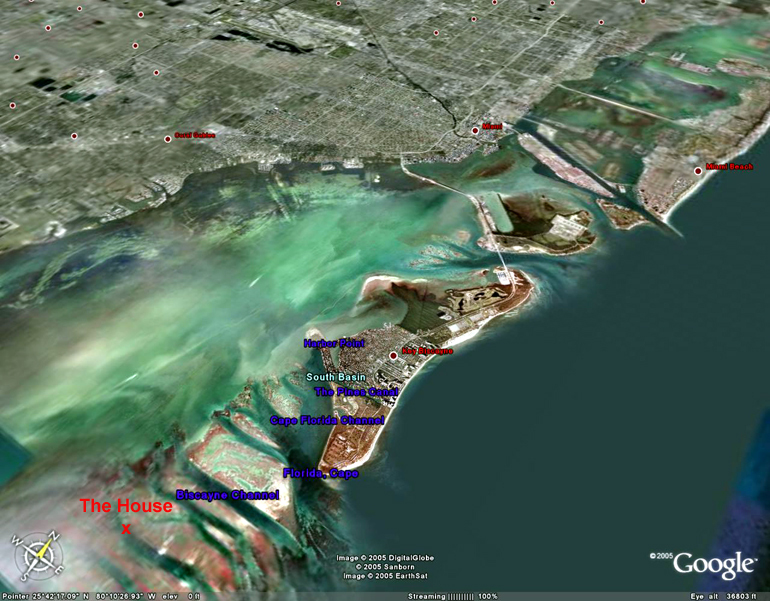 No end of paddling areas around Northern Biscayne Bay. 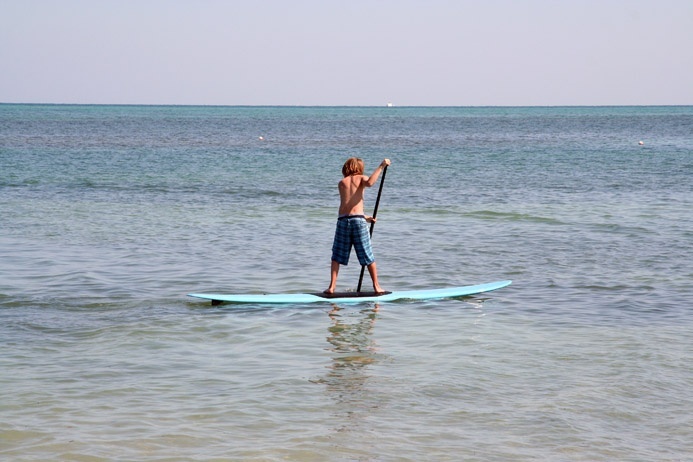 You can ride wind swells or even hit some waves off the fringing reef to seaward about 900 ft. off Key Biscayne. I suspect this is going to take off in the area sometime soon. Last edited by RickI; 04-11-2007 at 07:56 AM.